Rangers are favourites for Tuesday's Scottish League Cup quarter-final against St Johnstone despite more financial turmoil at Ibrox, according to Saints captain Dave Mackay. The Ibrox club accepted a £2m loan from Newcastle United owner Mike Ashley with the Glasgow outfit having been 48 hours from going into administration. "I can't imagine it will affect the Rangers players," said Mackay. "Judging on form, Rangers will be favourites - they've been going well." Rangers' boardroom turmoil has continued with news of the departure of chief executive Graham Wallace, but Ally McCoist's team were not diverted from their pursuit of Scottish Championship leaders Hearts as they won 3-0 away to Dumbarton on Saturday. "They are the home team, they have players who are playing in the first division but probably shouldn't be. They are high earners," Mackay added. St Johnstone travel to Glasgow as the Scottish Premiership club but have failed to beat Rangers there in their five most recent meetings. However, that last victory over the Light Blues also came in the quarter-finals of the League Cup - 2-0 in November 2006, when the Perth side were in the second tier and Rangers were in the top flight. Saints also have good recent memories of Tuesday's venue, having won on their last trip to Ibrox Stadium - a 2-1 Scottish Cup semi-final victory over Aberdeen in April. "We had the semi-final there against Aberdeen and we obviously won the last time we were there, so hopefully we can repeat that kind of performance and result," said Mackay. And the defender is hopeful that Saints can build on Saturday's 0-0 draw away to Partick Thistle - a result that ended a run of five straight league defeats. "We've still got a lot to do and can do a lot better in certain areas, but it gives a little bit of a boost going into the game," said Mackay. "You're certainly not wanting to go into a Cup quarter-final on the back of six league defeats in a row. "We know that if we play as well as we can play, which we haven't done enough of this season, then we can cause an upset." 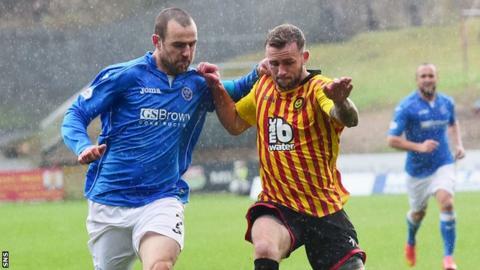 Mackay admits St Johnstone's confidence had taken a knock in recent weeks. "When you're on a run of five straight defeats, it's got to - you see Motherwell in the exact same position," he said. "Obviously confidence is low, but it can change very quickly. "We have another two games coming up in the next five days, so it can all turn round very quickly and hopefully we can take little bit of confidence with a clean sheet going into the game at Ibrox, another tough game."